Luigi Dallapiccola: Quaderno musicale di Annalibera (1952) for solo piano. A set of 11 small pieces or movements, intended to be played all together in sequence, at once individual character pieces (some with particular technical concerns ("Accents", "Rhythms", "Colors") and variations or variants on/of common material (a single 12-tone row in transposition and in its classical transformations). Some of the pieces are aphoristic in length, others a bit more substantial, the whole perhaps 14 minutes in duration. Much has been noted about the 12-tone aspects of the piece — I can recall, as a 14-year old, working out those rows as if they were the more sophisticated thing in the world, and yes, I'm a bit surprised to be including two mid-20th century 12-tone pieces in a row in this list of personal landmarks — as well as the connections to Second Viennese School (not least to piano pieces by Schoenberg and Webern*) and further back, through both the strict and not-so-strict canonic aspects (some even housed in a trio of movements identified as Contrapuncti), a recurring down-a-semitone, up-a-minor-third, down-a-semitone (yep, that spells B-A-C-H) figure and that "notebook" title to J.S. Bach, all of which is an interesting mix of the potentially useful and the possibly misleading, and none of which may actually capture much of the substance of this work. This is in part due to playful misdirection on the composer's part. The title, for example. Bach's famous little notebook was a collection of delightful but modest pedagogical pieces for a student (Bach's second wife, Anna Magdalena) to play. But Dallapiccola's piece, while dedicated to his young daughter, Annalibera, is sophisticated and challenging music intended not as a loose collection of teaching pieces but as a whole and integral work of concert music that is also well-suited for private use.he first piece or movement, "SIMBOLO" (symbol), is permeated by transpositions and transformations of the B-A-C-H figure, but it avoids a literal B-A-C-H cypher at that pitch level and in that direction. What he's after is something musically more significant than a alpha-musical homage and that is to use that tight semitonal cluster to anchor smooth voice leading in a harmonic environment that is not shy to suggest tonal movement, indeed even cadential resolution. This suggestion of the tonal is something quite different from the embedding or citation of authentically tonal material within a 12-tone scheme (like Berg, for example); it is almost uniquely comfortable in its ambiguity and that's something I have always found refreshing in Dallapiccola's later music. This did cost Dallapiccola some street cred with the serial generation on both sides of the Atlantic, with their programmatic tendency to deprecate any tonal suggestion, from objects like triads and seventh chords (which Dallapiccola welcomed, if cautiously, as products of voice leading but not of functional harmony), or processes like canons (on which Dallapiccola thrived) . Even his admirers sometimes appear to dismiss the work as too simple or too pretty. And it is often gorgeous, but cooly (cool, not cold) gorgeous, although inspired by the almost anti-pianistic keyboard works of Schoenberg and Webern, it was written by a pianist-composer whose catalogue was mostly vocal, but who knew how to write atmospherically, often even vocally, for his instrument, understanding register, articulation, handedness, the use of the pedal and resonance in a very different way than his Viennese models, focusing on the more delicate features of the instrument. The ninth piece, "COLORE", for example, with a gentle counter-metric swing of seventh-ish chords is very much a piece that can be located with the coolest jazz pianism of roughly the same era as not influenced or influencing but sharing aspects of a common sensibility (again: cool, not cold). * Babbitt, in the lecture collection Words about Music, has some striking observations about the relationship of the Quaderno's "CONTRAPUNCTUS SECUNDUS" to the second movement of the Webern Variationen, in which the relationship between fixed pitches and intervals is exchanged. Roberto Gerhard: Concert for 8 (1962) for flute, clarinet, guitar, mandolin, accordion, percussion, piano, and double bass. The Catalan composer Gerhard (1896-1970) was one of Schoenberg's Berlin students (an international group that included Nikos Skalkottas, Marc Blitzstein, Norbert von Hannenheim) and his career bridged over the Second World War, giving an unusual breadth with some of his early works incorporating folk elements, his latter works using twelve tone techniques, electro-acoustic tape, and even some degrees of Cage-acknowledging indeterminacy. Fleeing Franco's Spain, his latter career was spent in England, with some important teaching stays in the United States. Gerhard's use of Schoenbergian twelve-tone techniques was sensitive and sophisticated, but the twelve tone aspect is perhaps the least interesting thing about the Concert for 8: it can say something about where the pitches come from, but this music is about far more than pitches and certainly more about where they're going than whence they've come. I suspect that it was his experience with electro-acoustic music that made the critical difference here for Gerhard. He insisted on the advantages of a composer working in the immediacy of his/her own studio, with an individualized components and set-up without the apparatus of staff engineers and bureaucracy that went with the large continental studios hosted by state radio stations. Working with only the assistance of his wife in recording sounds, Gerhard's relationship to his material had an immediacy akin to that of the independent studios in the US (and he would, indeed, have a more positive relationship to the young composers at the Cooperative Studio in Ann Arbor than his colleagues at the University of Michigan. )* Let's be clear: Concert for 8 is not electroacoustic music, it is instrumental chamber music for a highly unconventional, even unlikely combination of instruments (if I recall correctly, it was the result of a private commission from a musically gifted family with an unusual instrumentarium) including plucked strings, an accordion, and a large battery of percussion instruments mostly not of determined or even discrete pitches (using such percussion is frequently a challenge to a twelve-tone premise, particularly when the composer wants to go beyond accents and noisy ornaments to the pitch scheme**) but it is music that is so focused on quality of sound the formation of sounds into broad gestures that the assumption is inescapable that it has been informed by an electroacoustic experience — that of concrete and instrumental sounds combined and placed into a continuity by the manipulation of magnetic tape. I cannot help but hear Concert for 8 as belonging in the company of "textural" works of its era, like those of Ligeti or Xenakis (composers a good generation younger than Gerhard), yet this is music that sounds consistently and refreshingly right at both the level of detail and of broad stroke, a kind of anti-stochastic music, to the degree to which a stochastic approach can mean that one is disinterested in or even ignores the precise details so long as they sum up to the desired larger view. * For a point of comparison, consider that Gerhard's colleagues working in German radio studio, would typically have to work with the mediation of a Tonmeister, a Sound Engineer, and a Tape Recorder Operator, who kept a protocol of each session. ** Compare Babbitt's highly rigorous use of trap set percussion in All Set. I'm very pleased to announce an online publication, The New Division, a collection of works by a large and international group of composers for solo alto recorder with or without accompaniment, based on ground basses found in the The Division Flute of 1706. 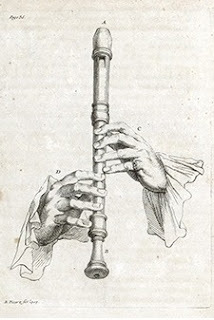 The Division Flute, published by John Walsh, was a collection of pieces for solo treble/alto recorder, mostly with accompaniment by continuo bass playing repeated grounds. (The collection also included a number of unaccompanied preludes, chaconnes, and Cibells (a gavotte-like dance based on a hit tune by Lully.)) Like similarly-named collections for the viol (which has been lost) and violin, it provides one of the best insights into the state of the art of instrumental music-making — from amateur to virtuoso — in its time. The art of playing divisions — or, if you like, diminutions or variations — to an existing piece of music or over a repeating bass line and/or harmony was a central part of Baroque musical practice by both by composers and improvising performers. Sophisticated bodies of solo divisions survive for violin and viol, lute and keyboards and, among wind instruments, principally the recorder, cornett, and, somewhat later, transverse flute. The New Division includes pieces offering a wide variety of styles and solutions to the elaboration of a bass as well as a Cibell for our time, with composers including (in alphabetical order) Jon Brenner, Steed Cowart, Elaine Fine, Christopher Fox, Danyel Franke, Jeffrey Harrington, Anne La Berge, Mary Jane Leach, Scott Mc Laughlin, Christopher Molla, Lloyd Rodgers, Conal Ryan, Jonathan Segel, and myself, with at least two additional items in prepation. This includes music playable by virtuosi as well as, in some cases, very good amateurs and both music comfortably within conventions and traditions and music that cheerfully challenges those conventions. And it's all online, here.